Twinsie Tuesday on a Thursday? Yup! Today is the group's one-year anniversary, and we're marking the occasion with some Then and Now. For original members, that means going back to its very first post, and those of us who joined later are revisiting our own firsts with the group. 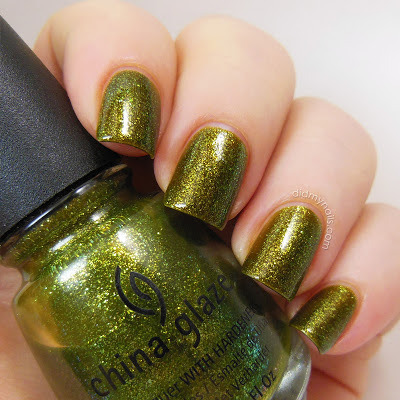 My first TT post was China Glaze Zombie Zest, a fabulously ugly-awesome green from the 2010 Halloween Awakening Collection. For your viewing pleasure, my original swatch, in all its oddly-lit, patchy glory. That thumb is the envy of hitchhikers around the world. Daaang. 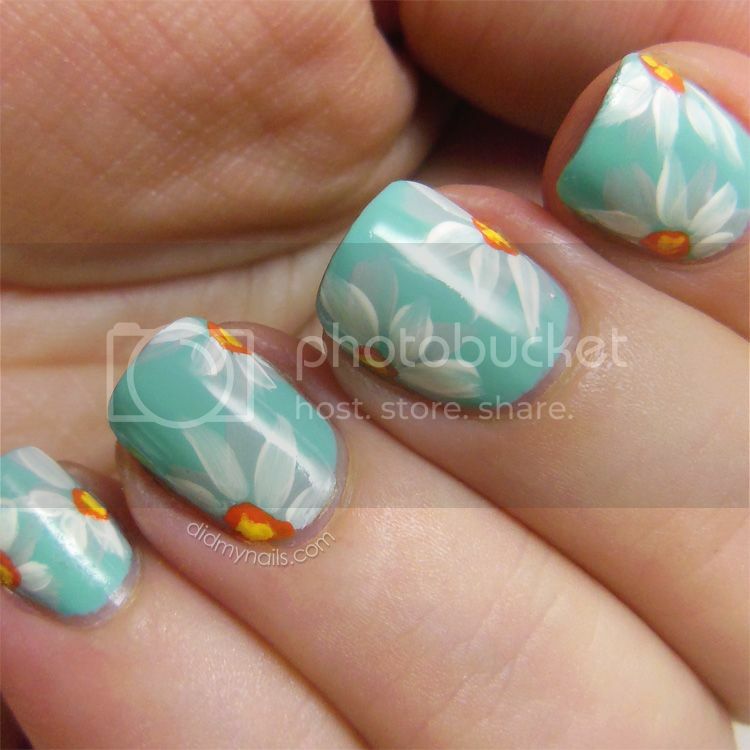 Lighting, nail shape, application, hand position, watermarking...I can't even believe how different it looks! And it's worth mentioning that I love this polish now even more than I did back then. 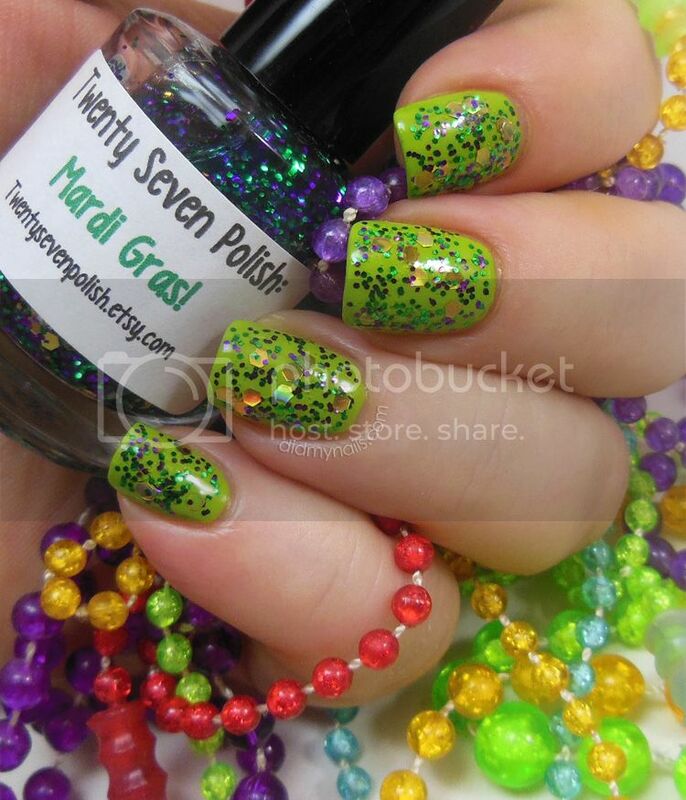 The glassflecks are so rich and sparkling, and the olive/lime green is all kinds of cool. Of course the pessimist in me can't help wondering what glaring flaws I'm going to see in these swatches a few months from now, because that's how my ego rolls. For now, though, I have to admit that I'm really encouraged to see that a little time and effort can produce such visible improvement, especially when I'm doing something I enjoy this much. Happy Anniversary to my fellow Twinsies--I'll be 'round in just a little bit to see more Then and Now! Super-long post today! By which I mean, super-short post today! 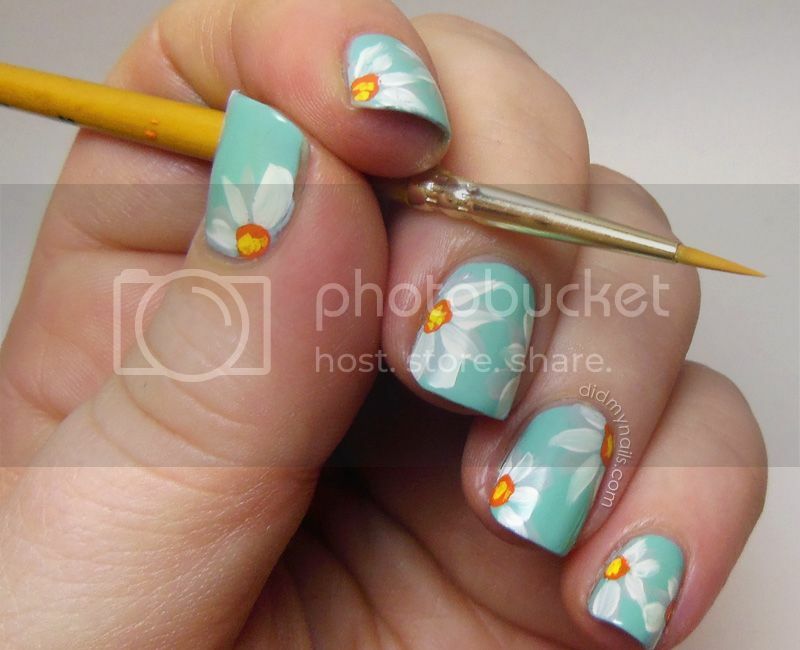 Before I took off The Hungry Asian Mint Condition to do yesterday's TT post, I decided to try a little flower nail art on top. I used acrylic paints for these, hoping to match the tiny red and blue glitter. Thought about doing the purple too, but I didn't want to go overboard and cover too much of the base. 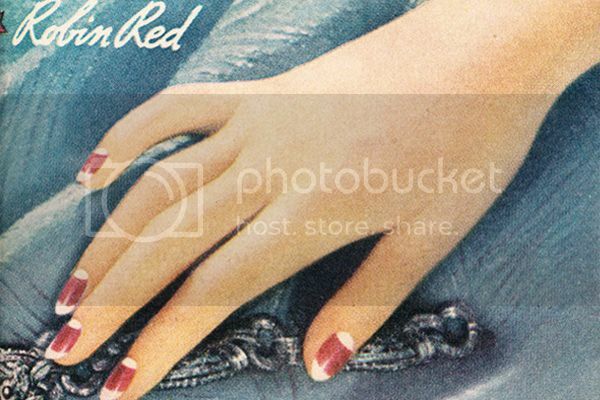 This week's TT theme is nails from a vintage beauty advert, and after googling the subject for several days, I've learned that with few exceptions, vintage nails = red. Possibly pink. Peach if you're adventurous. Black if you're rich and live in ancient China. Without a doubt, Revlon Cherries in the Snow, first introduced in the early '50's, is one of the nail polish classics. And since half-moon manicures were all the rage as far back as the 1930's, I decided to combine the two for today's vintage nails. 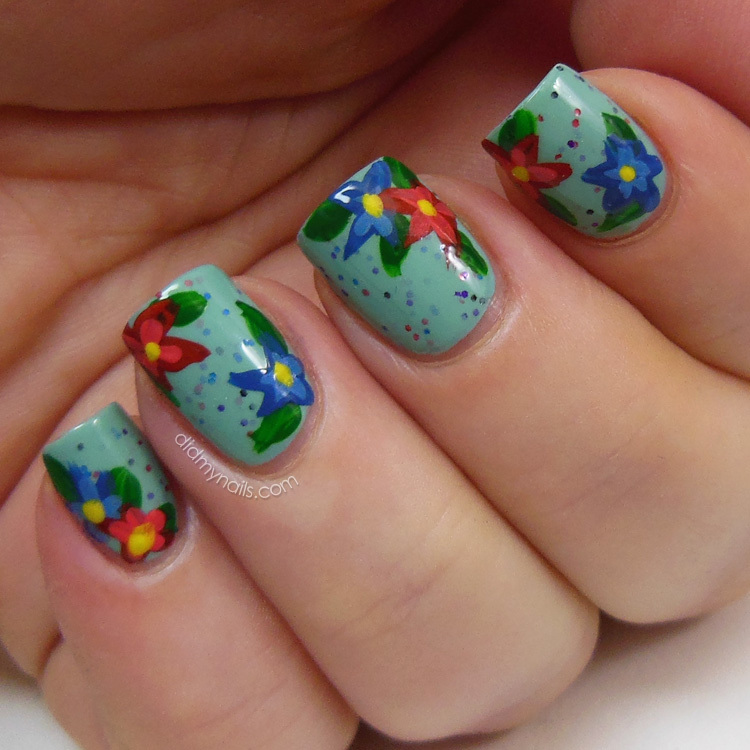 ...only when I tried to replicate the look, it did not look right on these square-ish tips. I also took a little liberty with the "unpainted" area. Namely, I painted it. Well, sponged it, to be more accurate, but come on--are you going to tell me those "Robin Red" nails are naturally that white? Advert colorizers, j'accuse! That's gotta be some pre-Photoshop fakery there. Still, I liked the higher-contrast look of the whitened half-moon and thought a roughly sponged application of OPI My Boyfriend Scales Walls might a) be a little softer, and b) look a little bit like snow, to go with my new Revlon Cherries in the Snow polish. I was actually out yesterday looking for a good vintage-looking red and stumbled across Cherries by chance in the bins at Sasa. I was surprised at how strongly pink it leans. In fact, I'd call it more raspberry than red, and in lower light it's practically fuchsia. The coverage on it is fantastic, though--if I hadn't planned to take pictures I could easily have gotten by with just one coat! I wonder how many of the other Twinsies went with half-moons and/or classic red for this theme? I'm literally finishing this up with about 2 minutes to go until posting time, so I'm about to find out! Mint Condition, from The Hungry Asian, is a big, whomping boatload of awesome. I've been wearing it for over 2 days now (which is ages in people time), and the longer I have it on, the more I love it. This polish is a minty teal with tiny, round dots of blue, red, and purple glitter that make it look like a colourful, speckled robin's egg. And not only is it all kinds of pretty, but Kae also did a fantastic job gauging the consistency. The teal base is dense enough to build to opacity in 2-3 coats (just for conservation, I'm wearing two here over one of China Glaze For Audrey), but at the same time, it's still sheer enough not to drown the miniature bits of glitter. That glitter even peeks through the layer above, adding some great depth to an already lovely polish! Mint Condition also applied very well. There was no streaking, and the glitters spread out smoothly, without any need for additional "placement" to get attractively random yet plentiful coverage. And maybe I'm gushing a little bit, but if I sat down and wrote a list of my Top Ten Favourite Polishes in the history of ever, The Hungry Asian Mint Condition would make it with room to spare. Whoops, spent a few days away and forgot to schedule any posts! No worries, though. Fun was had at HK Disneyland, and I'm back in the swing with Midnight in Schuman Forest, from Lacquistry. Midnight in Schuman Forest caught my eye with its pretty, jewel-toned colours. I'm usually into brighter shades, but I really like this combination--its rich, deep colour scheme still has plenty of sparkle and shine! It includes large, medium, and small hexes of navy, green, silver, and brown, all in a clear base. Here, I'm wearing about a coat and a half over Essie Going Incognito (a dusty forest-green with a hint of teal). The glitter applied easily enough with a mix of stroking and some dabbing to fill a couple of spots, lying flat and looking glassy-smooth with a coat of SV on top. 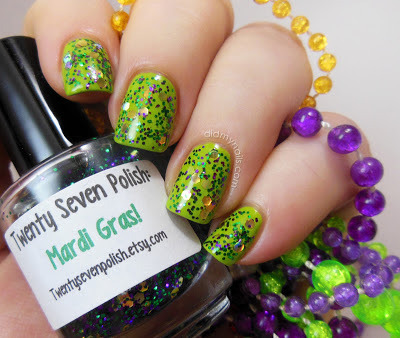 Today I'm wearing--and loving--Mardi Gras! by Twenty Seven Polish. 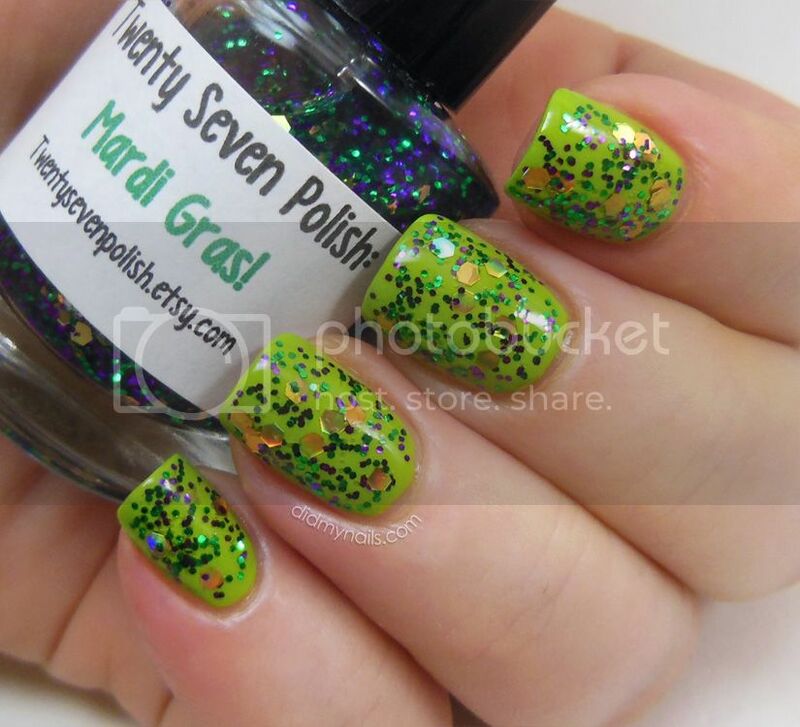 I've had it for a couple of months and have been saving it, looking forward to Mardi Gras season, and this polish could not be more perfect for it! Okay, maybe if it came with a Dixie beer and some red beans and rice, but there's only so much one bottle of nail polish can do. Still...LOVE! 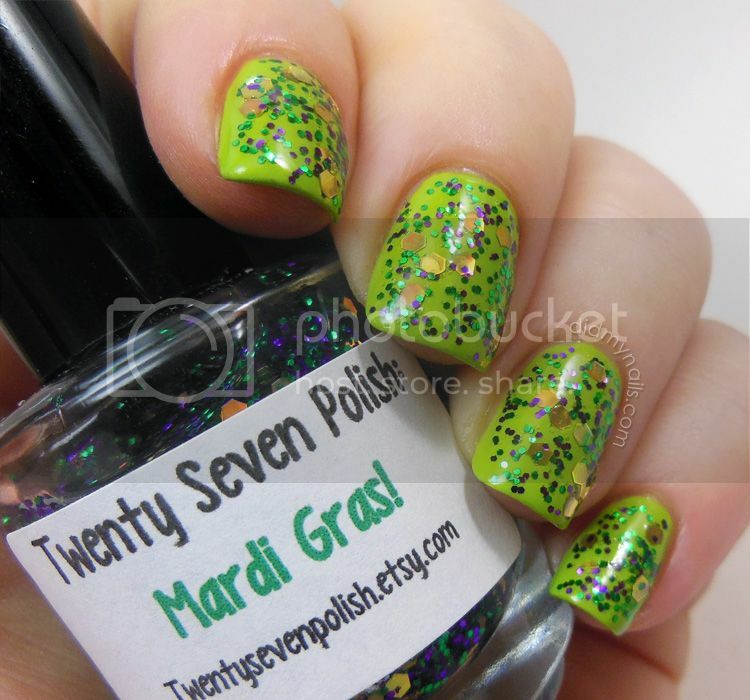 This is one generously dabbed coat of Mardi Gras! over China Glaze Def Defying, followed by a coat of Gelous, plus one of SV. I don't know that it actually needed that much top coat, but the total effect was really stunning. Glassy-smooth and shiny, and the golden hexes still shone like crazy. I actually didn't realize when I ordered Mardi Gras! that the gold was holographic, but I kept staring at my nails all day, loving the way they caught the light. The vast majority of cervical cancers are caused by HPV, a virus for which there are currently two vaccines (really, vaccines that may actually prevent cancer). The odds of surviving cervical cancer improve greatly with early detection, and a regular Pap test can discover even minor abnormalities in cervical cells, allowing for treatment before they have the chance to turn into something scarier. Smear tests and vaccination shots may not be any fun, but they could literally save your life. 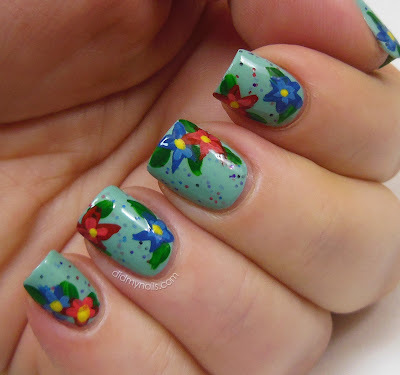 With that food for thought simmering away, it's time to turn to this week's nails! 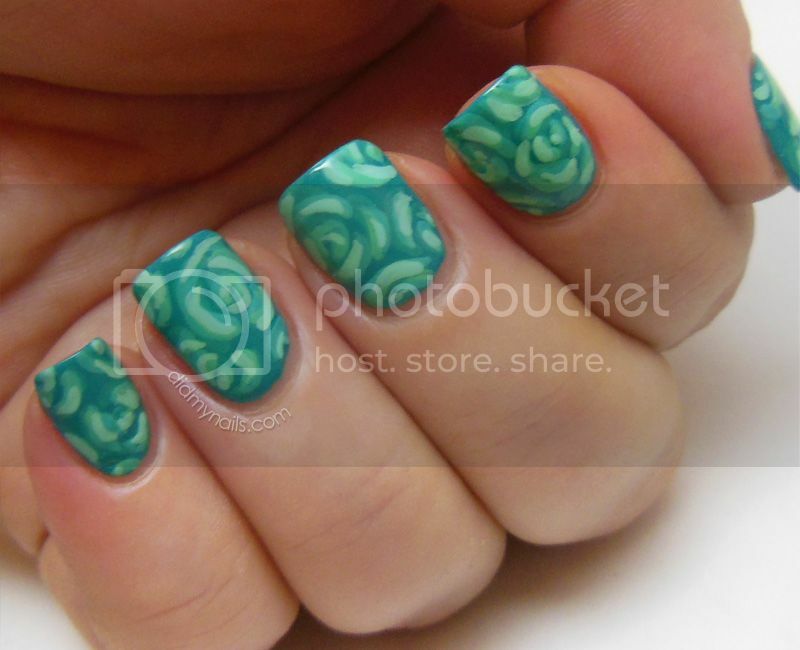 As I mentioned, teal is the colour of Cervical Cancer Awareness, so I decided to go teal-on-teal with some acrylic paint nail art roses, based on ones in this Robin Moses tutorial. Starting with a base of Skinfood BL514, I mixed some turquoise acrylic paint with a touch of white and started in. I ended up doing 4 layers of paint, though, as opposed to Robin's simple, pretty 2, because I'm still not that good at mixing my colours yet. "Okay, this is drying too close to the base, so I need to add more white...and now it's skewing more blue, so I should add a tiny bit of green...ack, too green now! Too green! Pull baaack!!" Colour-mixing issues aside, I have to say I'm satisfied with my first attempt at these. Loads of room for improvement, but they came out well enough that I can look forward to doing them again sometime. Plus they were a lot of fun to do, which is always a plus! For more takes on teal, please check out some the other TT blogs! And for more information on Cervical Cancer Awareness Month, you can visit Cancer Connect by clicking here. In Japan over Christmas, Husband and I got to spend a day at one of our favourite places on the planet, Tokyo Disneyland! Unfortunately, living in tropical Hong Kong, where storage space is a dream known only to the ludicrously wealthy (or the uncomfortably squished), I don't really own cold-weather clothes anymore. And it was freezing in Tokyo. So while at the park, I bought a scarf to bundle up in, thus simultaneously avoiding hypothermia and getting the idea for these leopard print nails a la Disney. This was my first real go at leopard print nail art, and I loved the result! Of course, despite everything looking fine to the naked eye, macro camera mode just had to show every little smudge and streak (it's such a frienemy to me), but whatever, I still think it's cute. With OPI Don't Pretzel My Buttons as the base, I added a couple of drops of Orly Beach Cruiser (a great, pink neon) to Revlon Passionate Pink for the dots. They dried slightly more neon than the scarf, but I didn't really care; the train to "subtle" had long since left the station. I finished off with OPI Suzi Loves Cowboys, top coated, took my pics, and spent the rest of the day wearing a scarf it really wasn't cold enough here to need. Honestly, though, how could I not? When the OPI Pirates of the Caribbean collection came out last May I was just starting to hit my polish-addiction stride but hadn't strayed much yet from my usual favourite shades. I thought I didn't really like softer colours much, nor purples, so I wasn't in any real hurry to try Planks A Lot. And then I did. And it was instant love. Naturally, because it's how these things work, the collection was long sold out here by then, so I conserved my little mini, guarding against that hypothetical polish emergency that would surely hit once I'd used it all, until Anna came to my rescue in our recent swap, heroically slaying this and several other lemmings in one fell swoop. I may not be wildly fond of straight pastels or purples, but Planks A Lot resides squarely within the Butter Zone of Awesomeness. It's not too light and not too dark, with just the slightest hint of dusty grey, and the soft, creme finish is just lovely! The formula was great on it as well, a little thin but still easy to control, and it self-leveled like a boss. I'm wearing three coats of Planks A Lot here, without any top coat because I was going to add some nail art to it later...which went horribly, horribly awry. No pictures survived to tell the tragic tale, but memories of the beautiful base live on. 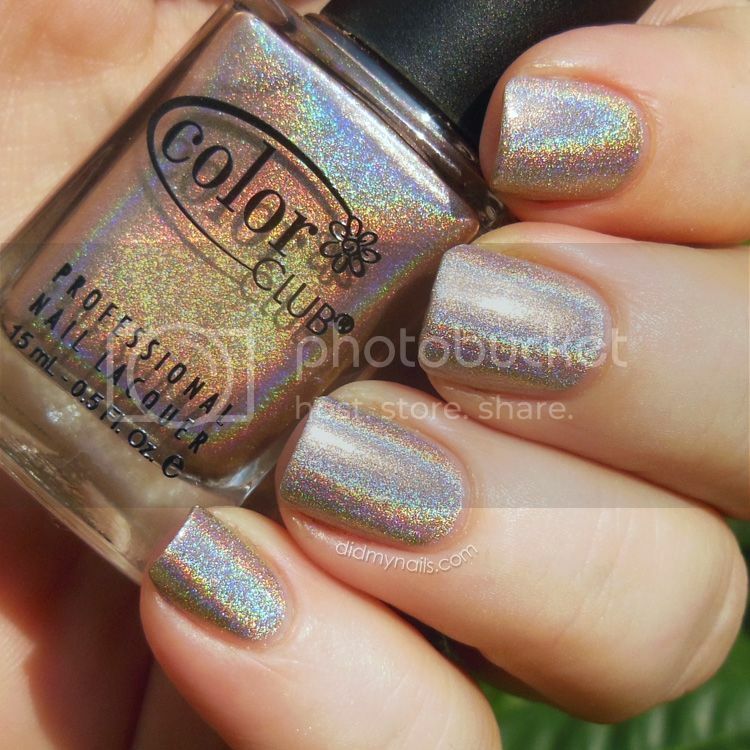 With the sun out again yesterday I took the opportunity to bust out another one of my new holos, Color Club Cherubic. Like Blue Heaven, it's from the Color Club Halo Hues collection. Also like Blue Heaven, the linear holographic effect is amazing. Cherubic is a soft, neutral beige that's incredibly close to my own skin tone. 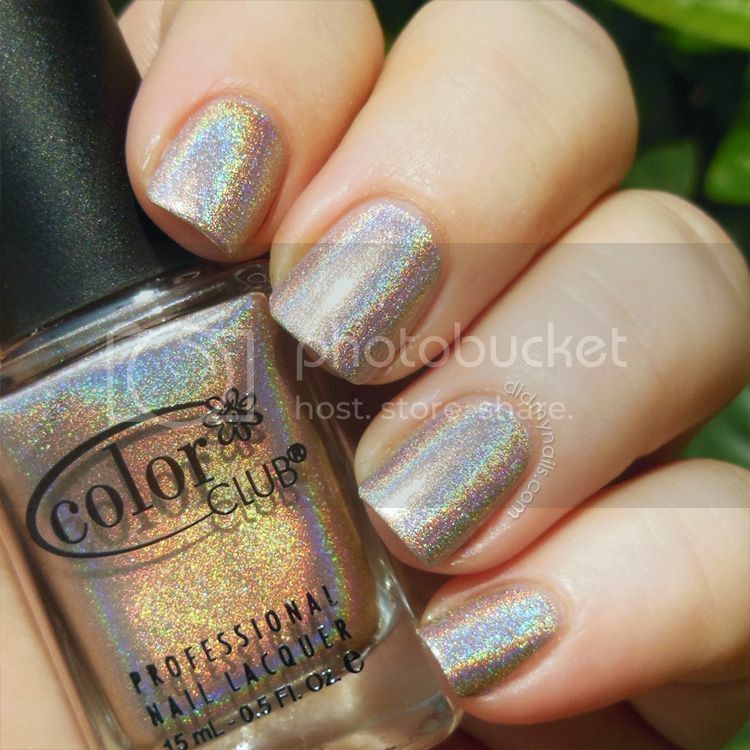 I thought at first I might find pale beige a little boring, given that I'm usually drawn to colours like bright aquas and lime greens, but duh, linear holographic nail polish is, by definition, awesome. And combining such a strong one with a subdued, neutral colour like this actually makes for a very appealing contrast! The formula on Cherubic is a winner as well. Applying evenly and smoothly, two coats would easily have been enough for full, opaque coverage, but I gave it a third because a) I'm a compulsive three-coater, and b) I wanted to make extra-sure I didn't have any thin spots before I took pictures, given its ninja-like ability to blend in with my colouring. So that's two of the Halo Hues tried, and both of them have been fabulous. Hopefully it won't be too long before the next sunny day, when I can go for a third! Also hopefully, I won't get the same puzzled looks I got yesterday when I walked outside and shoved my hand in the bushes. That lady was really confused. I like to mix things up when I do my nails. It seems like I have an ever-growing list of things I want to try doing with them, but I was surprised to realize that it had been nearly two weeks since I last wore glitter! I mean, I tried one out yesterday, but the undies were all wrong, and it only lasted about 20 minutes..so no wonder I was feeling a little run-down this morning. My internal glitter engine was clearly running low and needed some sparkle, stat! I decided to wear one of my new glitters, I ♥ The Jersey Shore, from Sparkle Nail Lacquer. I ♥ The Jersey Shore--which I've also seen as "I (heart)" and "I <3"-- is a clear-based glitter topper with the cutest blue squares, as well as copper mini-bars and pink heart glitters. It also has an amazing shimmer to it, in the form of clear/white micro-glitter, that's really unique and adds a great dimension to this polish. This is two coats over a nice, basic base of OPI Don't Pretzel My Buttons, which I picked for its sandy colour. I may wear this over a light pink or blue next time, but I couldn't let go of the sand/shore idea for its first outing. Application was very smooth and easy! It was a good thickness for spreading and controlling well, and the glitters themselves distributed in an orderly fashion, not clumping or rushing towards the tip. And there are plenty of the little hearts to go around too. Both hands got two without having to fish for them, and it was easy to snag a 3rd for my ring finger here. Aside from the cute, original glitter mix, I was also happy to get this polish because I have family in and around New Jersey, some of whom were hit by Hurricane Sandy, and for each bottle of this polish sold, Sparkle Nail Lacquer (on Etsy, here) will donate a dollar to the American Red Cross, in appreciation of its efforts after the storm. 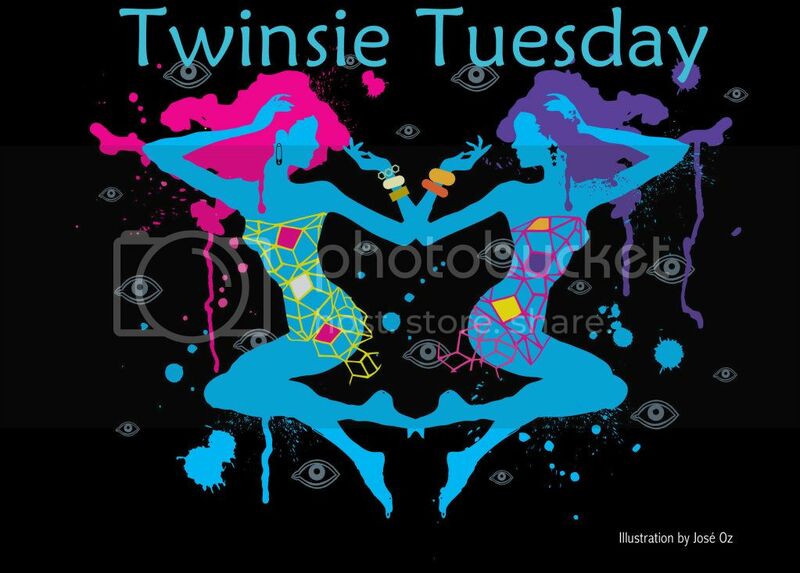 I could not believe the trouble I had with this week's Twinsie Tuesday theme! "Red" should have been relatively simple, right? Maybe I just had too many choices, I don't know...I swatched a pretty red, but it was all bubble town. Swatched another, and it was streaky and uneven. I chose a cute, red glitter, but the undies were all wrong. Two nail art manicures only revealed the depths of their true horror in macro camera mode. 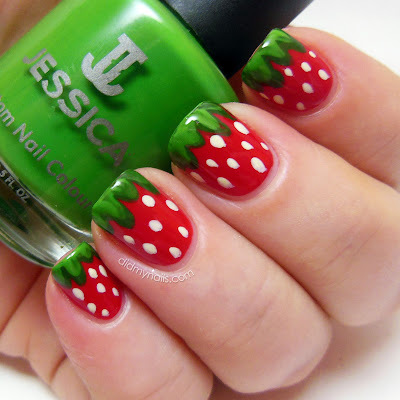 So once again, frustrated and probably trying to be too fancy for my own good at that point, I went back to the beginning, to one of the first nail art manicures I ever did, strawberry nails. Woot, they're red! I used Revlon Fire for that part, then Jessica Mint Mojito Green for the leaves, mixing in a drop of black to paint the darker green first. The little seeds are a mix of white with a touch of yellow, which I applied with a paint brush, but I think they were cuter when I used to dot them. I do really like the way the leaves came out, though, so yay for that part! I really hope the rest of the Twinsies had an easier time with "Red" than I did. And speaking of my Twinsies, check out Cordia's big giveaway! This has been a great week for my untried polishes! Today I have Color Club Blue Heaven, an amazing holographic nail polish in light blue from this winter's Halo Hues collection. Talk about instant love! The holo effect was already dazzling, even in relatively dim light, but I knew I wanted to photograph it outside. So I was walking down the hall, trying not to bump into stuff because I kept staring at my nails, trying to imagine how they could possibly get more intense. Then I stepped into the sunlight and shouted, "Holy crap!" Because I'm eloquent like that. And the thing is? These pictures still don't show the full effect! The depth of the colours was very much like the bottle, but my camera did the best it could in the face of all the sunlight and rainbow crammed onto my little nails. And for all of Blue Heaven's colourful flare, the formula was great as well. No cuticle pulling or streaks at all. It wasn't runny or thin, and it self-leveled beautifully. It was opaque in two coats, but I did my usual three. No top coat this time, since I only planned to wear it for a day or so, but next time I wear Blue Heaven I'll probably sandwich a top coat in there between layers. I only picked two of the Halo Hues when I saw them in stock because I figured, "Well, a lot of these pale shades are so similar that I don't really need them all..." But as soon as I finished taking these pictures I marched right back to the store with a quickness. If the others are anything close to the fiery brilliance of Blue Heaven, I'm going to be very happy indeed! It's been a teal kinda week! This time I went with Skinfood BL003, Green Bean Milk, from their Milk Creamy Nail series. It's much bluer than anything I'd associate with green beans, but I'm crazy about the colour! I love the little milk bottle shape as well. It's pretty close to a mini at 8ml, but it was also a lot cheaper than most "name brand" polishes go for here. Formula was good on it too. My first coat was nearly "crelly" and see-through in some spots, and it is prone to some cuticle pulling when you go back over it if it isn't dry. It's a very nice, easy thickness and brush to work with, though, and despite my reservations after the somewhat thin first coat, the second built up very nicely to opacity. I could have stopped there, but I did a third for pictures and topped it with Sally Hansen Insta-Dry. Like most light aquas and teals, Green Bean Milk lobsters my fingertips a bit, but I just don't care. I can't resist these pretty shades! BL003 is very similar to China Glaze For Audrey, with only a touch more green to it, and that lands it smack dab in the middle of my favourite colours to wear on my nails. 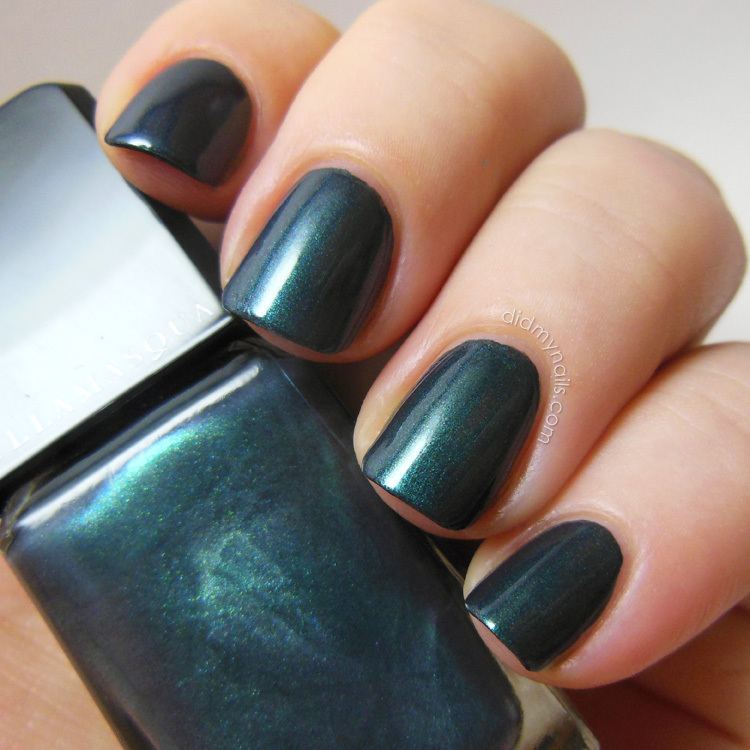 Today I have some swatches of a gorgeous polish, Illamsaqua Viridian. 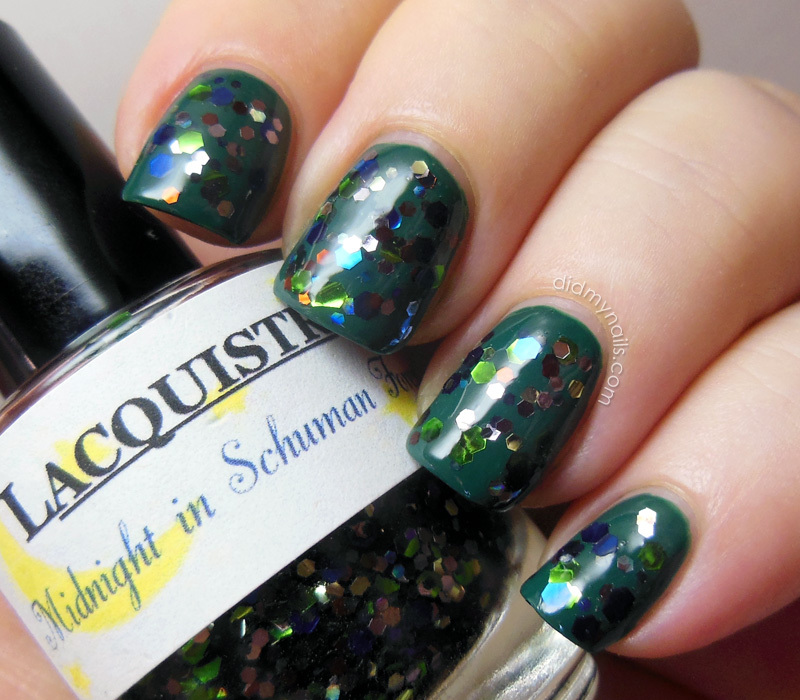 Illamasqua describes it as peacock green, with a metallic finish. I'm totally on board with the "peacock"--I actually thought of the colour, before I even read that, as some sort of awesome love child of a peacock and a beetle (which, I don't even wanna know how those two got together, but I hope those crazy kids make it work). "Metallic" I'm not so sure about. I see it as more of a very deep shimmer with just a little bit of metallic, or even pearl. Not enough to define the finish but enough to make it richly luxurious. There's also just a teeny hint of duochrome to it, barely noticeable, but it adds yet another dimension. If you look at the corners of the bottle and at the very sides of the nails, you may be able to see that tinge of purple. I'm wearing two coats here (with a coat of SV on top), but with careful application you could actually get away with just one. It's quite a thick polish but not unmanageably so; it stays where you put it and spreads well and evenly. Plus I'm crazy about the colour! It definitely leans strongly green, but it's also nicely teal-blue as well. And the shade falls somewhere between jewel-toned and vampy, somehow managing to be rich and dark and yet also very colourful. This is one complicated polish! Illamasqua released Viridian and its duo partner, Scarab (a similarly rich red), in the fall of 2010 as the Art of Darkness collection. I've really been looking forward to today's Twinsie Tuesday theme, saran wrap nails; it's one of my favourite techniques! I love the look, and it's such a quick and easy process too. My last couple of saran wrap manicures used bold black and dark grey (and some neon pink too! ), so this time I wanted to do something soft and neutral. And then aqua and turquoise snuck in there, because I couldn't help myself. Just a quick note to say I actually followed through on one of my New Year's resolutions, which was to purchase my domain name. DMN is now at didmynails.com! It may take another day or so for it to finish propagating, but the .blogspot address automatically forwards to it (meaning there's no need to change links and what-not). While I'm thinking about site stuff, I'd love to ask a question: do you guys prefer having posts all on the main page or having a pic or two on the main, then clicking through if you're interested in seeing more? There are good arguments either way, and I've done a bit of each. Currently I'm posting together unless I have more than 3 pics, in which case I break it up, but I'd be interested to know what you think. Part of the Cosmic FX line from autumn 2010, Orly Space Cadet was one of the first polishes that went on my wish list when I started hoarding...er, collecting...no, no, hoarding is right...nail polish. Given its age and how few places in Hong Kong carry Orly, though, I'd pretty much given up finding it until I hit an Ulta in the States this past summer with Brandi, and lo and behold, she spied a couple of bottles hiding in their Dark Shadows Collection display! Seriously, when she showed it to me, I squeaked out loud, and yes, there was probably dancing too. Orly Space Cadet is a richly multichrome foil. I was nervous about being able to capture its incredibly dramatic shifts on camera, but it cooperated quite willingly! Pictures still don't do it complete justice, but you can see its awesome range, from a deep, rosy red to purple to copper/bronze, gold, and brightly olive green. I'm wearing 3-4 coats here, as it was a little thin, but the effect is totally worth it. I may try layering it over black next time, just as an experiment, since removal was every bit as fun as you'd expect 4 coats of foil to be. Still, though. Worth it. It's so nice when a lemming actually lives up to expectations! So I was still loving OPI My Private Jet and didn't want to take it off yet, but I was in the mood to do a little something extra with it, which led me to haul out my stamping stuff and give it another shot. I've seen some very cool stamp results with the new Color Club holos, so that's what I decided to try. This is My Private Jet stamped with Color Club Blue Heaven, using my favourite pattern from Konad plate m73. The effect is subtle, but I really like it! At arm's length, you can't really see the pattern itself, just the flashes and flares of the holographic polish, but the closer you get, the more the pattern comes into focus. Thankfully not too into focus, since my stamping skills are still a little rough, but I think I'm over the initial learning curve and looking forward to doing more of it. 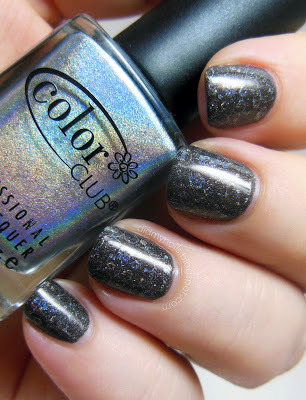 The holographic effect of these new Color Clubs really is pretty amazing--I have got to try them out on their own! OPI My Private Jet is a bit of a notorious polish. Since discontinuing the original, highly holographic version, OPI has released several subsequent incarnations, all under the same name. Each features slightly different shades of brown with varying degrees of grey, and while a couple have holographic particles, none comes close to the incredible flare of the original. The thing is, though, that if you're measuring each against the original release and hoping for the same thing, you're bound to be disappointed. When Anna sent me a bottle in a recent swap, I was eager to see how it stood on its own merits, and I'm happy to say that whatever version this is, I really, really like it! Thanks, Anna! This is three coats of OPI My Private Jet with SV top coat. It's a rich brown with grey overtones and light, scattered, holographic particles, both of which are stronger than I was able to capture on camera, but if you click the picture above you should be able to see a hint of how it shines. No, it's not the original version, but it's not a pony either. It's a beautiful, dusty brown with a pretty, holographic shimmer. This is definitely a polish I'm going to wear again and again. Sure, I'll keep my eyes out for that elusive, original unicorn, but this version is very much my style.